Santouka Ramen – Is it that good? One day, a friend and I were talking about ramen, and I was advised that this ramen shop inside the Mitsuwa Marketplace food court is rated number one by who knows what. I was skeptical, a ramen at some food court is at the top amongst all the ramen in Los Angeles? Not a stranger at all to this food court in Torrance, I have been going there regularly for many years for the udon at Mifune. Having never paid much attention to the ramen there, I decided to grab a friend to try out this infamous noodle shop. I was surprised to see a line in front of this tiny store front. As I waited, I noticed to my right side, were the realistic looking plastic displays of all the different ramen sets one could choose from, along with the prices. One could choose from salt ramen, soy sauce ramen, miso or spicy miso ramen. There were three sizes: small, medium or large. The different combo sets included one of the following over a small bowl of rice: ikura (salmon roe), or natto (fermented soy bean), or chopped green onions, or pork and chopped green onions. Two halves of a marinated boiled egg also came with the set. I decided on the Combo set of salt ramen with the Ikura don, medium size. There were plenty of ikura on top of the rice. The saltiness of the salmon roe mixed well with the ever so slight sweetness of the Japanese rice. 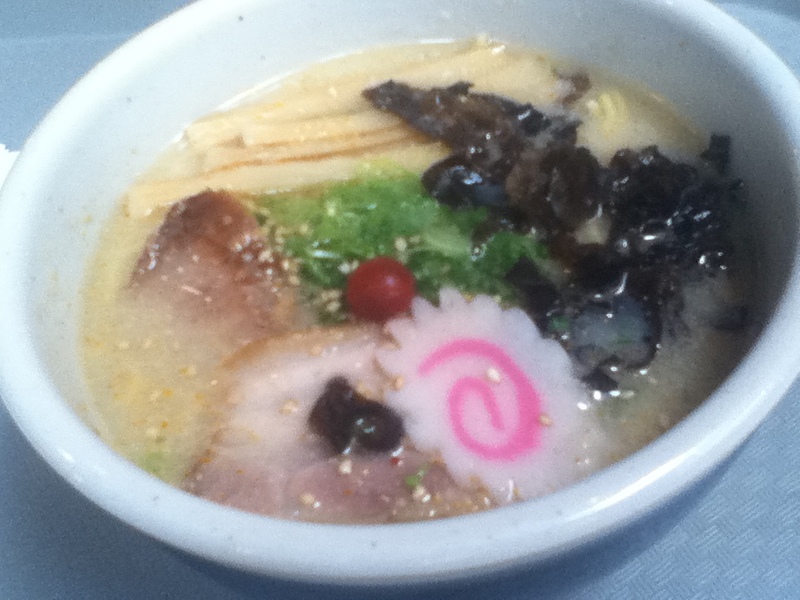 The different toppings on the ramen looked aesthetically pleasing and well thought out. There were the two slices of fatty pork, some bamboo shoots, bits of cloud ear, a piece of fish cake, some chopped green onions, and a umeboshi (pickled plum). The pork had a good ratio of fat to meat, about half and half, was tender and well flavored. All the other ingredients tasted in harmony with each other. I especially liked the crunchiness and the unique taste of the bamboo shoots. The umeboshi was a nice touch to help balance out the saltiness of the broth. While not a connoisseur of ramen, I would say the Santouka offers a tasty, solid ramen that is well crafted and of top quality. I would, however, prefer the broth to be much less salty, so that one can consume more of it without worrying about the high salt content.